Type 1 Diabetes - This type of diabetes occurs when the body fails to produce sufficient amount of insulin. Type 2 Diabetes - This type of diabetes occurs when the body fails to use the produced insulin effectively. Type 2 diabetes is by far the most common disorder and most of the patients who suffer from diabetes mellitus are diagnosed under type 2 diabetes. Diabetes is a chronic disease that requires care and immediate action. Whole grains, fruits, nuts, green leafy vegetables have been linked to a decreased risk of developing diabetes mellitus. What we eat and how much we eat plays a crucial role in maintaining the health of the body and reducing the symptoms of an underlying disease. Different food items have a different glycaemic index. A glycaemic index is defined as the way in which the blood glucose level of the body is affected by a particular food. It measures how a person responds to the food that contains carbohydrates as compared to a person’s response to glucose. Nuts are the nutrient dense food that contains the variety of macro and micronutrients that have a beneficial effect on the diabetes mellitus and other health complications. The consumption of nuts has been associated with many beneficial effects as they are highly rich in proteins, vitamins, and minerals. For diabetics, nuts are considered to be a very nutritious item and it may look small in size but are filled with all the essential nutrients. Nuts are rich in magnesium which plays a great role in regulating the blood glucose level and are also a good source of fiber which reduces the gastric emptying and as a result, it decreases the rates of fats and carbohydrates break down and glucose absorption. Diabetes mellitus is highly associated with high body mass index and fats and carbohydrates play an important role in body mass index. Cinnamon has been widely used as a herbal remedy to manage diabetes as it helps in controlling the blood glucose level of the body. Cinnamon has many pharmacological properties such as antioxidant activity, antibacterial effects, natural insulin sensitizer and bioactive products that improves the glucose and insulin metabolism. According to one of the studies, consumption of cinnamon on a daily basis leads to the major reduction in fasting blood glucose, triglyceride, low density lipoprotein, and the cholesterol level as well. All these factors play a role in the development of diabetes mellitus and having a control over them will help in the proper management of diabetes. Keeping a control of blood glucose level is very important for the patients who are suffering from diabetes mellitus and to everyone who is at a risk of developing it. The consumption of flaxseeds has been reported to have a significant reduction in the blood glucose level and cholesterol level and it is due to a lower content of glycemic carbohydrates and higher content of dietary fibers in the flaxseeds. Flaxseeds are highly rich in fibers, lignans, and fatty acids that act as a protective agent against diabetes mellitus. 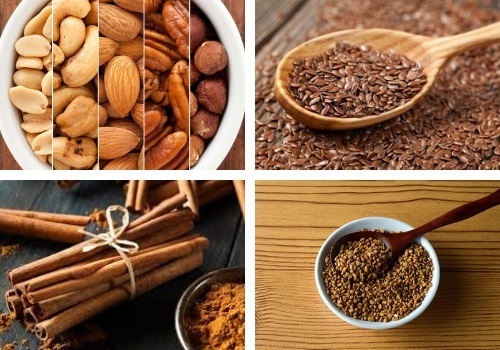 Various studies suggest that flaxseeds inhibit the expression of the phosphoenolpyruvate carboxykinase gene, which is a key enzyme for the development of diabetes. Fenugreek is widely distributed throughout the world and is widely used as a medicinal herb. There are a number of compounds that are known to be present in fenugreek that shows their action on the reduction of blood sugar level. Many researchers believe that fenugreek inhibits the absorption of sugar from gut to blood in order to reduce the blood sugar level and it is also believed that it has an effect on the secretion of insulin from Beta cells of the pancreas. Fenugreek contains an ingredient diosgenin which improves glucose metabolism by promoting the adipocyte differentiation. Not only this, it also inhibits the inflammation present in the adipose tissue. Tags: Benefits Of Yoga On Diabetics, 4 O's That Affects Bone Health, Know about common vision disorders, Why Is Obesity A topic Of Health Concern?